Whether you have something to sell or something to say reaching your audience where and when they are receptive is key. 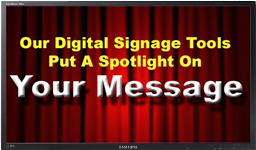 For over twenty years Design Computer Systems has been helping our clients deploy effective Digital Signage and Broadcasting solutions while avoiding costly mistakes. From simple video playback to elaborate network solutions our products, tools, and expertise will make your project a success.